What is Hallways to Health? The School-Based Health Alliance’s Hallways to Health (H2H) initiative pushes for wellness to extend beyond school-based health center (SBHC) walls and into the broader school and community. Our H2H sites work to change policies that advance population health in healthy eating/active living and social/emotional wellness. 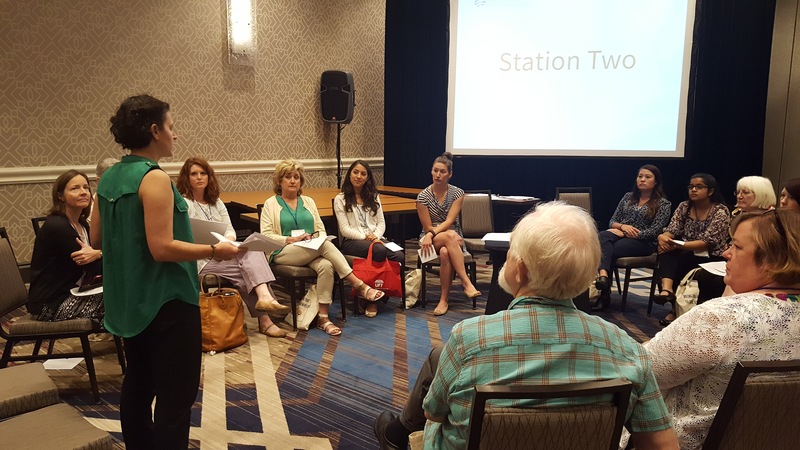 The 2016 National School-Based Health Care Convention gave these sites a chance to gather, train, network, and ponder the progress of the past year. The meeting also made time for hands-on learning to identify and develop strategies that engage stakeholders. Using tools such as the Message Box tool and Influence/Interest Grid, H2H sites pointed out which groups of stakeholders were most relevant to their work and thought critically about how the H2H work aligns with each group’s priorities. Sites used this information to craft and practice delivering elevator pitches to catch the eye of select groups of stakeholders. As the day came to a close, they took a moment to celebrate the innovation, hard work, and dedication of our grantees and gave out much-deserved awards and recognition. During the annual convention, representatives from our H2H cohort led an interactive workshop called “SBHCs Leading Efforts to Improve Population Health Outcomes.” Aurora Chavez of San Fernando High (California), Mandy LeBlanc of Washington Middle School (Washington), Mizan Alkebulan-Abakah of Roosevelt Middle School (California), and Sara Trivette of Turner Elementary School (Georgia) led role playing exercises that simulated real experiences from their time in the program. The exercises weighed the benefits and challenges of partnering with various players in the school-based health care arena. Workshop attendees had plenty to discuss: school and community buy-in, school-wide policy implementation, and mission alignment. With the guidance of H2H project coordinators, the participants devised methods to address conflicting interests, garner support within the community and schools, and implement policy changes. They also gained insight into their partners’ potential thoughts and agendas—an important aspect of trying to engage different stakeholders. The session attendees left excited to share their newfound tools, tips, and resources with their SBHC teams at home. These meetings energized Hallways to Health sites to learn from and share with other sites doing similar work. Sites formed stronger bonds with other cohort members, their state affiliates, and the School-Based Health Alliance team. The meeting connected the cohort and demonstrating the national reach and impact of their innovative efforts to change the trajectory of health and delivery of health care. They will use what they learned during the convention to plan for the next academic year, and we can’t wait to see the fruits of their efforts! Regional meetings will continue in the fall where sites will engage their local school districts, sponsoring organizations, and public health entities in the innovative H2H work. If you want to learn more about Hallways to Health, please contact Jordanna Snyder at jsnyder@sbh4all.org.